You may order here on line, or go to our online mail order form if you would rather order product by mail. All prices include US shipping. Non-US customers, e-mail for shipping information. 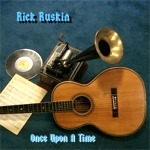 Rick Ruskin returns to his roots and presents with complete honesty and reverence, yet in his own unique style, a full CD of traditional and original blues. 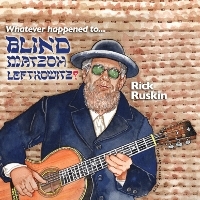 Read the story of Blind Matzoh Leftkowitz now. Hear clips/download MP3’s from: CD Baby NOW! The traditional sound of acoustic finger-style guitar in front of decidedly non-traditional musical settings. Not "New-Age" as it is currently defined, but most definitely new, and as with all of Rick’s work, unique and melodic. Some vocals have been included in this collection as well. This is the recording that Rick Ruskin fans have been waiting for. 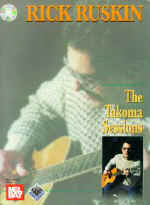 The album contains 25 selections - 17 from Rick's three ground breaking Takoma Records releases, RICHARD RUSKIN, MICROPHONE FEVER, AND SIX-STRING CONSPIRACY plus 8 duet and ensemble pieces from his legendary ON THE CHEAP LP. It's a CD everyone will enjoy regardless of musical tastes. 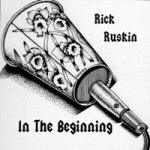 Rick's first new solo recording since 1997, featuring 11 instrumentals and 3 vocal tracks all with that unique Ruskin touch.. Get one for yourself and a few more for friends! 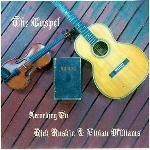 A unique collection of well known Gospel tunes arranged as Guitar and Fiddle duets performed by Rick and Pacific Northwest Fiddle Champion Vivian Williams. Rick's solo CD from 1997 featuring all original compositions. A must have. These are new vinyl - sealed. Limited - when they're gone, they're gone. Rick Ruskin's remarkable style captures all the nuances of a band/rhythm-section and transforms the parts into amazing, in-the-pocket fingerstyle grooves like you've never imagined on a single guitar! Split-screen video format covers: right- and left-hand technique, walking bass and counterpoint lines, open-voiced triads, simultaneous bass/rhythm/lead parts, pedal-steel effects, double-stop bends, harmonics and more. 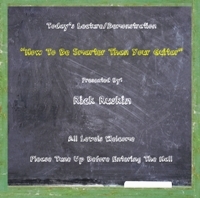 The techniques are immediately put to use in extraordinary instrumental versions of: Rikki Don't Lose That Number (Steely Dan), Georgia On My Mind, and four originals, each in standard tuning. His meticulous blow-by-blow analysis of each phrase is loaded with variations and insight that show how to transform the essence of any tune into dynamic arrangements of your own. Truly an important work that should not be missed! Click the links to view the video clips. Running Time: 120 minutes Musical notation & tab is printable from the disc (DVD-ROM) and included with the VHS version. 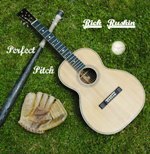 In this video, Rick Ruskin sets aside the guitaristic clichés that have long been associated with the acoustic guitar. He gets to the heart of what makes an R&B track work on a six-string and teaches you how to think like an ensemble. His unique "rhythm-section" arranging techniques are used to construct captivating parts that emulate the essential (and then some) elements of a rhythm section. Once a groove is established, lead lines and other embellishments are then threaded into the mix. In the end it’s hard to believe that so much music is coming from a single instrument! Rick also demonstrates the process of building groove-oriented compositions from the ground up, and also applies the techniques to arranging classic tunes such as Otis Redding's "(Sittin' On) The Dock of the Bay." He will ignite your creativity by showing how a few changes to a basic riff can yield an entirely different feel from which you can build your own compositions and arrangements. If you’re not already familiar with Ruskin’s material, this video will certainly change your perspective of what is possible on the instrument. Back by popular demand! 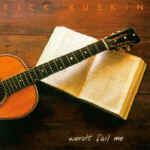 This complete book of note-for-note TAB/notation transcriptions from the Words Fail Me CD has just been re-issued. Hurry before this limited edition is sold out!